We had a great speaker at our local quilt guild meeting last night, Robin Bogaert from Quiltingintheloft . Her trunk show entitled “My Quilting Journey” travelled back in time as far as mine. It’s fun to identify with “Oh ya!, I remember that.” Robin is an active blogger and has been featured in Quilter’s Connection Magazine. I checked out her blog this morning and found this interesting post. The 18 resolutions are something I am going to try to work on. Doesn’t the above look typical and how it is all crammed into a box? Kind of a symbol to what we all do, take on too much and cram in too much in our lives. Having said that, we all make resolutions and we try to keep them but I do believe it is an important process to put goals on paper. As a list maker myself, I find writing down goals a sure way to get something done. This surely does not mean everything, but it is a good starting point. I will share with you my goals/resolutions for 2016 and encourage you to write down your own as a guideline to accomplishment! 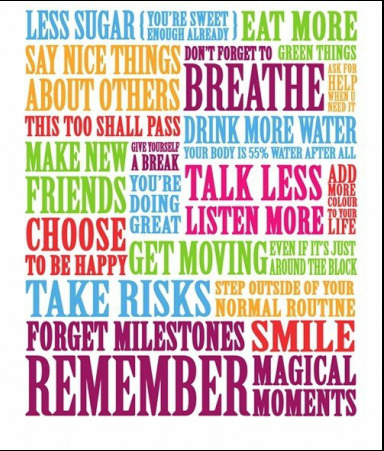 My “Guideline to Accomplishment” for 2016! Love your fabric, what you have and what you buy. Donate what you don’t love including your UFO’s (unfinished objects) and/or work on a charitable project! Drink tons of water when you sew. Get up and walk around every 20 minutes when you sew, give your back a break. Work on something that makes you happy. Accept all sewing compliments, say thank you and don’t point out where you went wrong. Sew and quilt how you want, not how someone else does it. Breathe and smile as you quilt. Play happy music or have a movie on. Enjoy your special talent. Take a class or ask advice from another quilter and give yourself time and patience to really learn the new skill. Sew if it makes you happy! I sincerely hope that everyone experiences happiness and good health this year and that your creative spirit soars!